"What's wrong with wanting to feel strong and graceful and beautiful?" Believe it or not, there was a time where Disney released live-action family films on a regular basis. Over the past 10-plus years, Disney has released seemingly nothing but animated features. Since the surprising success of The Rookie and The Princess Diaries, it seems that Disney has renewed interest in their family film division. 2005 has seen the recent high-profile release of Herbie Fully Loaded, as well as the much-lower profile unveiling of Ice Princess. Unfortunately, the lack of success for these last two live-action Disney films might bring them back to a stricter animated focus. Sure, they've been responsible for their share of animated classics, but it's nice to see the studio change it up from time to time and let "real" actors, both child and adult, show their stuff. The increased animated presence that other studios have recently brought into play is another factor that could keep films like Ice Princess as mere pipe dreams from now on, which is a shame. 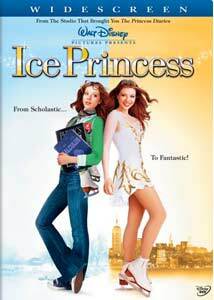 Ice Princess tells the story of Casey Carlyle (Michelle Trachtenberg), a very intelligent high school student who is facing a crossroads in her life. Casey not only excels at school but at figure skating as well, and her aggressive mother (Joan Cusack) has always pushed her to focus on her school work. Casey's mom has been particularly stern lately with the start of her senior year upon her. With aspirations to attend Harvard, Casey jumps at an opportunity for a scholarship that requires the completion of a project, which leads her to the study of the physics of figure skating. She then meets the Harwood family, more specifically, Tina (Kim Cattrall), a skating instructor with a checkered past, and a daughter (Hayden Panettiere) who is the ultimate snob. After spending most of her initial time studying about the skating itself, Casey soon realizes that she just might be interested in taking up the sport after all. Tina begins to train her, feeling as if she has uncovered a diamond in the rough. Casey's success as a skater seems to be a positive thing, that is until she faces the prospect of telling her mother about this new interest, which could threaten her Harvard studies. This is as formulaic as Disney films get, but in this case, that isn't a bad thing. Ice Princess is the type of film that you would have no problem sitting down and watching with the entire family, with no worries about any inappropriate themes or subject matter. Teenage girls will probably get the most out of this project, as the protagonist is on the verge of finishing high school and moving on to college, and has to deal with an overbearing mother. Let's face it, the overbearing mother and strict sports coach characters have been done before, but they are handled here (thanks to fine performances by Cusack and Cattrall, respectively) in a way that will strike a chord with these teenage viewers, while refraining from being overly preachy. Aside from the wonderful work by Cusack and Cattrall, the star of the show, Michelle Trachtenberg, really comes into her own here, maturing past her role on Buffy, The Vampire Slayer, which most viewers will know her from. While Trachtenberg might not showcase the same promise that young actresses like Emmy Rossum (The Phantom of the Opera) and Anne Hathaway (the aforementioned Princess Diaries films), Ice Princess should prove to be only the beginning for this youngster. It's also nice to see Kim Cattrall stretch her acting abilities (possibly for the first time since Big Trouble in Little China) as the sports coach. She fights the clichés for the most part, creating a memorable figure that is not without her own internal struggles. The way that she battles these struggles, yet still finds the time and effort to make Casey the best skater, and person that she can possibly be, almost single-handedly makes this project worth a look. Image Transfer Review: The film is presented in 1.85:1 anamorphic widescreen, and image clarity and detail is what you would expect from a film that was in theaters only recently. The white of the ice hockey rink sparkles along with the rest of the eye-popping color scheme. True fleshtones, along with excellent sharpness and contrast round out this great presentation, that has hardly any dirt, grain, or other print flaws. Audio Transfer Review: The Dolby Digital 5.1 audio is also impressive and up to snuff with recent films. Pop music makes up the majority of the soundtrack, and these tunes sound great, utilizing all of the surround speakers. The dialogue is precise and completely clear, never being drowned out by any of the other audio elements. Extras Review: A somewhat paltry collection of extras begins with a large collection of Sneak Peaks for other Disney projects, and continues with an audio commentary track with young actors, Michelle Trachtenberg, Hayden Panettiere, Kirsten Olson, and Trevor Blumas. This focuses mostly on these youngsters experience in the actual filming of Ice Princess, with Trachtenberg sounding the most mature, and, therefore, the most interesting. Next, we have five Deleted Scenes, including an alternate opening sequence that shows Casey at a much younger age, and leads into the beginning of the theatrical version. The rest of the cut scenes don't add a whole lot of information, but are worth a look. The only other bonus features are a pair of music videos: Reach by Caleigh Peters and No One by Aly & A.J. These are typical teen pop songs that the film's target demographic will surely love. If you're looking for a surprising, new breed of live-action family film, Ice Princess isn't for you. However, if you long for the days where the entire family can sit down and watch a movie without any objectionable material, then this is definitely worth a rental. While light on extras, this DVD does showcase some excellent audio and video.